Defense Technology Pepper Spray manufactured in 2016. 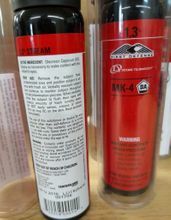 We have a few cans of the MK4, 3.0 oz, Flip Top Stream with 1.3% OC formula. These are in their original clear plastic tubes and still have several years of life. This inventory has always been kept in air conditioned storage so its likely to be good as new.